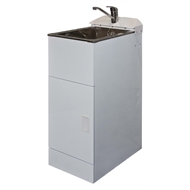 The CT Petite Smart Tub is a fully featured laundry system with the smallest footprint available. At only 350mm wide and 540mm deep you can fit this almost anywhere. Perfect for apartments, flats, baches and those times when there is just not enough room. Features concealed washing machine taps, all pressure 40mm mixer tap, pressed stainless steel tub, reversible door and childproof safety catch. WARRANTY AND GUARANTEE OF THE LAUNDRY SYSTEM RANGE. 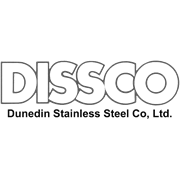 DUNEDIN STAINLESS STEEL CO LTD GUARANTEES THE DISSCO LAUNDRY SYSTEM RANGE OF PRODUCTS AGAINST DEFECTS IN MATERIALS AND WORKMANSHIP FOR A WARRANTY PERIOD OF TWELVE MONTHS. THIS WARRANTY IS IN ADDITION TO ANY RIGHTS THE CUSTOMER MAY HAVE UNDER CURRENT “CONSUMER GUARANTEES ACT’ AND THE “FAIR TRADING ACT”. CLAIMS FOR DAMAGE WILL NOT BE ACCEPTED BY DISSCO. WE RECOMMEND INSPECTION AT TIME OF PURCHASE REGARDLESS OF CARTON CONDITION. PRODUCT THAT HAS BEEN INSTALLED AND FOUND TO BE FAULTY SHOULD BE NOTIFIED TO DISSCO AS SOON AS POSSIBLE SO THAT PROMPT REMIDY CAN TAKE PLACE. CLAIMS FOR WARRANTY SERVICE SHOULD BE MADE BY THE OWNER DIRECT TO DUNEDIN STAINLESS STEEL CO LTD. Ph. 03 477-3448 fax 03 477 3101 email info@dissco.co.nz.